May I take this opportunity to wish readers a happy “moral and aesthetic nightmare”. That definition of Christmas belongs to the late Christopher Hitchens. Anybody can slag off Christmas, but it takes a smart way with words to make so few of them so telling: the short-tempered, hyperbolic Scrooginess turning the tables on Christianity by accusing it of offending not only against taste but morality. It also takes a brave indifference to the affection of the multitude. In an age of emoticons, smiley voices and glutinous celebrities, when the din of television audiences applauding mediocrity seems to drown out all other sounds, and when those who are too ideological to smile pursue their affiliations like drilled recruits – left, right, left, right – how badly we have needed Hitchens’ gruff recusancy, his principled refusal to be emollient and of like mind. Yet, for a writer who wrote so much that was contrary, he was the recipient – as his obituaries have shown – of an uncommon devotion. It isn’t to deny his gifts or achievements in any way to wonder about that devotion. Love is its own subject, and the question of what inspires it, especially where it appears not to have been sought, is one no serious person should baulk at. That he was loved to the degree he was by his friends doesn’t surprise me a jot. He had a genius for friendship. I didn’t know him well, but, on the few occasions I met him, I felt the power of his personal charm and was able to imagine what fun it would have been to while away an afternoon talking and drinking in his company. As someone you might bump into on the street, he was beguilingly courteous, and, when mention of mutual friends arose, fiercely loyal. If his Oxford friendships, especially with Martin Amis, have become mythologised, that is partly the doing of a literary readership that is fascinated (or repelled) by the idea of a charmed circle, but it was also, to a degree, the doing of the charmed themselves. We can allow that. Modesty goes with the territory and will show as a virtue or a vice depending on what’s made of it. The proper study of mankind is man: and, all along, Hitchens used his infamous burning the candle at both ends to great effect, making his bohemianism its own answer to sanctimony, and finally letting us into the physical, unmysterious anguish of his dying, an unsparing self-scrutineer to the last. It intrigues me that the cooler appraisals of his genius have come from women. It isn’t that they don’t get him, but that they don’t get him the way men get him. Though we fight shy of gender distinctions, there is, it seems to me, roughly put, such a thing as a man’s writer, and Hitchens was one. The unequivocation of the argument, the wit that revels in destroying everything in its path, the open declaration of hostilities and abjurations – these are not the qualities you look for in novels, where meaning lurks round corners, and straight lines don’t take you anywhere you want to go, and if men, by and large, don’t read novels with the passion women do, the circuitous perplexities of fiction might explain why Hitchens’ polemics found a more direct path into their hearts. It is, anyway, in the heroic language of warriors unashamed to express their love for one another that he’s been mourned, by friends and by bloggers the world over. “Farewell comrade”, “goodnight sweet prince”, etc. You can see why this muscular sentimentality might exclude some women. Of the unambiguous polemics for which he was revered, the least successful, to my mind, was the assault on God, though I don’t doubt it’s for that work that a whole generation (of men?) fell in love with him. I don’t, let me be clear, speak as a believer; I, too, abominate certainty, and pound for pound probably believe in less than Hitchens did, never having made a god, for example, of Trotsky or an idol of Orwell. But it was his thoroughgoing independence and scepticism I admired most, and he betrayed both, in my view, when he voiced an utterly conventional atheism, aping Dawkins in supposing that all people who call themselves religious are fools and every verse of the Bible was written by a “crude uncultured mammal”. Dawkins’ virtual appropriation of Hitchens’ illness – finding in it proof that an atheist dies better than a Christian – strikes me as tasteless. Altogether, there was a terrible cruelty, whether Hitchens felt it this way or not, in his having to die in the full glare of anticipation – no matter if it was the religious who were waiting for him to crack, or the atheists who were willing him not to. I have no reason to believe, and no interest in believing, that he wavered, however unbearable the suffering, but it was his right to do so had he wished. And it would not have been an apostasy. As it was, in the months of his dying and in the immediate aftermath of his death, something in the nature of a religious cult grew up. A godless god of reason dying not for our sins but the erroneousness of our beliefs. The irony would not have been lost on him. 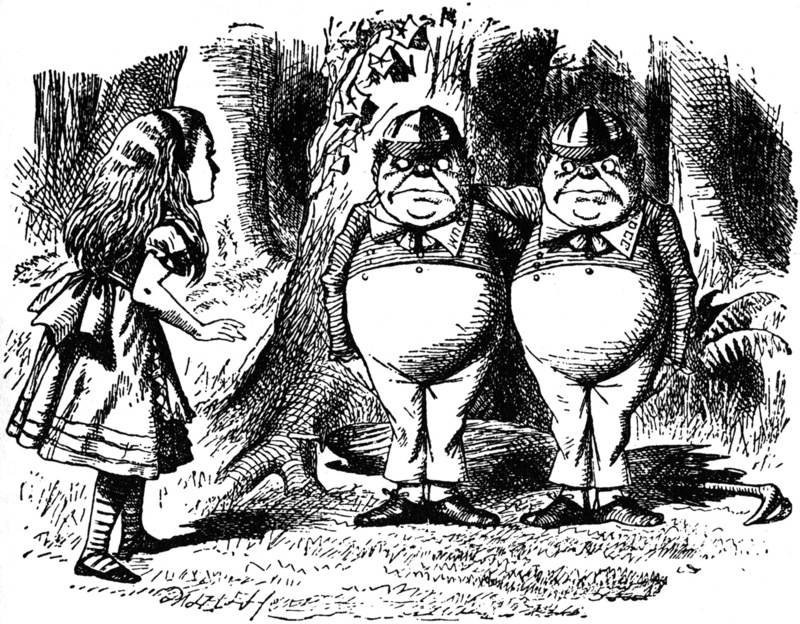 Illustration from Lewis Carroll’s 1871 Through the Looking-Glass, and What Alice Found There, by John Tenniel (1820 – 1914).